Dr. Olasunkanmi Adeyinka is a board certified physician and clinical assistant professor for the Department of Family and Community Medicine at McGovern Medical School at UTHealth. Dr. Adeyinka sees patients of all ages. She is devoted to providing high quality, compassionate care through open communication. Her goal is to help all patients achieve optimal health through promoting healthy lifestyle and disease prevention. 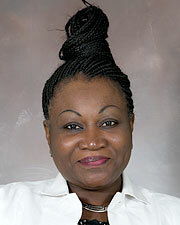 Dr. Adeyinka has received several teaching awards during her career. When she is not caring for her patients, Dr. Adeyinka enjoys reading and traveling. All good. 1. Very good. I left with a "I don't know what's wrong with you" no plan of treatment no bloodwork nothing but I guess that's what I get for being the last patient seen. said we had opposing views on health issues and therefore she would not be a good fit for me because I didn't not listen and follow her orders. I concurred. *Dr. Adeyinka is the best!! !